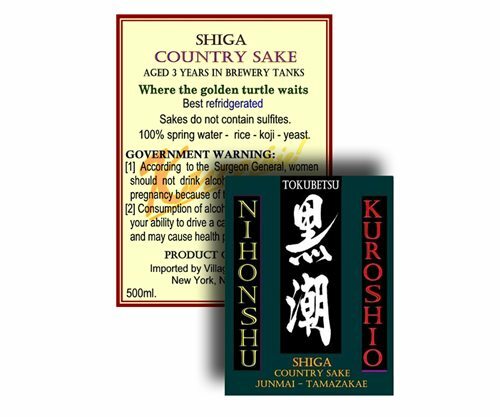 TTB classifies sake as a wine, for label purposes. Most wines have sulfites — but sake appears to be a notable exception. On the Shiga Sake label above, Village Wine reports that “Sakes do not contain sulfites.” TTB does not seem to disagree and has approved many such labels. The TTB doesn’t seem to mind that refrigerate is misspelled, either! There are a lot of wines without SO2 one only has to look at any Whole Foods, Trader Joes or Publix store. TTB just has issues that they don’t understand how to read their own lab reports stating 0 ppm SO2. So they take the easy wimp way out by forcing wineries that go the extra mile and make these wines to have to say “NO ADDED SULFITES” or “NO Detectable Sulfites” Which most people are just plain confused about.. TTB must not be able to afford to educate their staff properly. TTB has a lot of Ph.D. beverage chemists. Do you really think they don’t know how to measure sulfites? Actually, even if sulphites are not added, they occur naturally in allmost all red and white wines as a biproduct of the aging process I was told when I asked some people at the swedish monopoly of alcoholic bevarages. According to international standards the “Contains sulphites” label is only added to wines with more than 10‰ sulphites, wich means that even whines without this label contains sulphites. Anybody that thinks TTB can measure SO2 levels properly and understand the wine making process needs only to look at the current financial situation the government books are in. Let me know if you think they are properly funded and educated in the very advanced methods they tout in anything to do with organic. Any body here trying to make SO2 Free wine and lost 10’s of thousands of liter of otherwise good wine?? Total SO 2 levels actually decrease with age in good true organic wine. reality is very odd indeed. No big producers i am aware of are yet learning much about this category, easier to just It’s just to expensive to experiment with. It’s easier to POO POO the brands. Do some home work and you will be amazed how many 0 PPM (Parts per Million) SO2 wines are out there. Globally. Some are very well known. Per your suggestion Jeremy I scoped out the government’s books and see what you mean that it is not a pretty picture. But I still don’t see how this implies that the government has trouble measuring sulfites. What do you want to do about sulfites that you can’t do? If you really want to avoid saying CONTAINS SULFITES all you have to do is provide a sample showing less than 10 ppm. And you can send it to a private lab if you want. Some details are here: http://www.ttb.gov/ssd/sulfite_waiver.shtml. Wineries that can prove with both USDA labs and Private labs that show 0 ppm want to be able to show this on their labels. To read SO2 FREE. Much like “Trans Fat Free” where they can still have 2 % by weight of trans fats. A O ppm is just that Zero parts of Sulfites and we still can’t print “So2 Free” on wine labels that have lab results showing this. Funny thing is that when you speak to any lab technician that does these analysis you will understand that this is not an exact science. It is very difficult to prove a liquid has exactly o ppm SO2 using the Oxygen Aeration method of testing . More education and funding is needed to grow an industry struggling to give consumers a healthier option. Any ideas on how to get TTB to allow 0PPM wines to show “SO2 FREE”? By my understanding this is a lengthy process and one i am keen to start. As i have 3 new wines that all show 0 ppm on analysis. As we are having to get very creative with labeling to differentiate the wines from Conventional. This will be getting more confusing for the consumer the longer it takes as we find artistic ways to show that the wines are 100% organic. The problem is not with the TTB they have an excellent lab. The issue is with us the winemakers wanting to go to the expense of testing the wine and sending a report to the TTB for something that is not really worth much in the end. Sulfites help preserve the wine period. Most issues people attribute to sulfites in wine are actually biogenic amines produced by spoilage organisms that are controllable with proper a proper sulfite regimen. I’m one of the 1% to 2% of the population that is actually allergic to sulfites and rarely have issues with sulfite levels in wine. Is there a wine with NO SULFITES for those like me who are allergic?